Mayor Kanofou Kieni of Teeraina was first elected Councillor for Tangkore, in 2014 to replace a former Councillor. In 2016 he was reelected and also elected Mayor. Born on Abemama in 1971 he was educated at Kiritimati Primary School and at St. Joseph’s College, Tabwiroa from 1986. His wife is Ema Taukaban; they have three daughters and two sons and belong to the Roman Catholics church. Mayor Takabiri Tebano of Tabuaeran was born on 10 December, 1959 on Aranuka. He was first elected as a Councillor for Tereitaki Village and then as Mayor for Tabuaeran in 2016. He was educated at Aranuka Primary school. He is a member of the Meleangi Tabai Secondary School’s Board of Directors. He wife, Rabunamwakin, is the chief cook at MTSS. They have two daughters and seven sons and are SDAs. 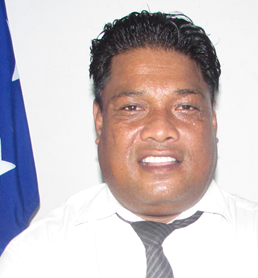 Mayor Bakaia Kiabo of Kiritimati Urban Council was born on 2 October, 1980 on Kiritimati. He was elected Councillor for Tabakea II and Mayor in 2016. He was educated at Taake-ni-Bairiki Primary, then at KGV&EBS from 1994. In 2007, he entered the Kiribati Institute of Technology in Betio. He is a member of the KUC, married to Kabitaware Koruu, with one boy and two girls. Mayor Eken Taumauri of Tamana was born on 6th June 1965 on Tamana. He attended Margaret Field Primary (Tamana) and KGV&EBS from 1978 to 1983. Then he joined the Kiribati Police Service (KPS) and worked his way up to the rank of Superintendent of Police. He was elected Councillor for Barebuka and shortly thereafter Mayor of Tamana in 2016. Eken is married to Taarem Mantoa, who works as X-Ray Technician at the MTC. They have four daughters and one son. Mayor Bureitiu Timon of Beru was first elected Councillor for Tabiang in 2012, got reelected in 2016 and elected Mayor later in the year. He was born in 1961 and educated at the Paris Primary on his island. He has also led the Catholic church as Chairperson of the Parish Committee for many years. He is married to Rereua Teimatoa, who in her own right, is a Magistrate on the island. They have two daughters and three sons. Mayor Tebamuri Teitia of Tabiteuea South was elected Councillor for Buariki village and Mayor for the island in 2016. Born on 7th February, 1959 on Tabiteuea South, he was educated at St. Michael Primary on his island. He has been the chairman of the KUC’s Island Church Council (ICC) for many years prior joining local government politics. He is married to Mareta Moamarawa and they have one daughter and two sons. Mayor Rotie Iaokiri was born on Nonouti in 1979. He was first elected a Councillor from Taboiaki North in 2016 and soon after as Mayor. He attended Taboiaki Primary School. He is married to Mawete Katua and they have three daughters and one son. Mayor Linda Ueanteang was born on 22 October, 1965 on Nauru and attended St. Peters Primary on Abemama and later the KGV&EBS (1978-1983). She joined Local Government politics in 2016 as Councillor for Tabiang Meang and then as Mayor, becoming the second consecutive female Mayor for the island. The Mayor has been a Board Member of many corporations on Tarawa, including KCCI (2012-16), BKL (2010-2014) and Otintaai Hotel (2012-2014). She has also been appointed to the Honours & Award Commission. She is married to Ueanteang. Mayor Areke Terurunga is the Councillor for Buariki Maiaki who was elected Councillor and Mayor in 2016. He was born on 11 March 1976 in Buariki village where he was first educated at Tewatebora Primary school. In 1990, he went to Kauma SDA Secondary on Abemama and then continued to St. Louis from 1993. He then joined the MTC and trained for seafaring work overseas, but soon decided to invest his time and skills for his community, so he stayed on his island. His wife is Tiekan Nikotaake and they have one son and one daughter.